Lately in addition to being on a mini album kick--I've been on a waterfall one as well. The waterfall technique has been around for ages. As far as I can tell it's one of the oldest ways of being able to store multiple photos in a decorative way. While scrolling through Pinterest I came upon a couple of photos on waterfalls that weren't the standard rectangle or square shapes--they were in fact--hearts. So I took on the challenge of creating a slider heart shaped waterfall. After a few bumps on the road, I managed to come up with a slider heart shaped waterfall & figured out that the same approach could be used to create a waterfall in any shape really. As long as the shape being used has some sort of 'anchor' that can be attached to the slider mechanism--it can be used. 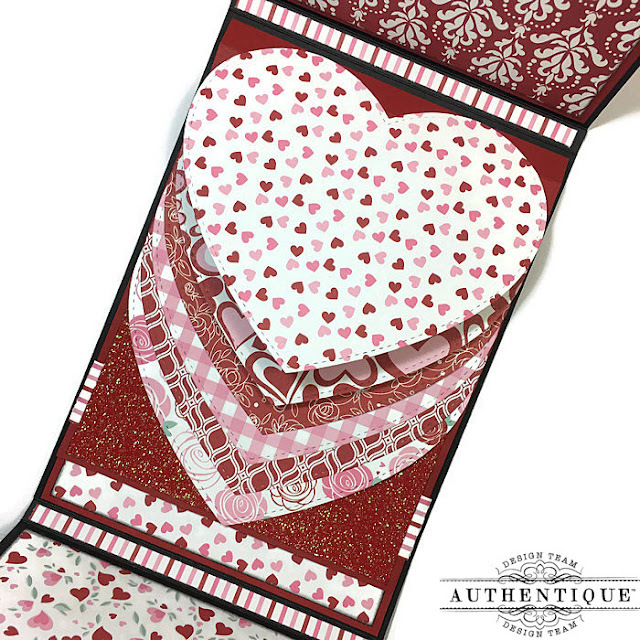 My first project was this Valentine's themed mini made with Authentique's 'Sweetheart' collection. It's a simple mini designed so that the heart shaped waterfall is the primary focus. The album measures approximately 8" x 5 3/4" inches with a 3/8" inch spine. Base of mini is made with 110lbs black card stock. It opens up to reveal three full length pockets & a heart shaped slider waterfall. Inside the pockets are several tags/booklets ranging in sizes from 7" x 5" inches to 3 3/4" x 3" inches. The bottom of the mini is what gives this album it's name. It's a heart shaped waterfall. 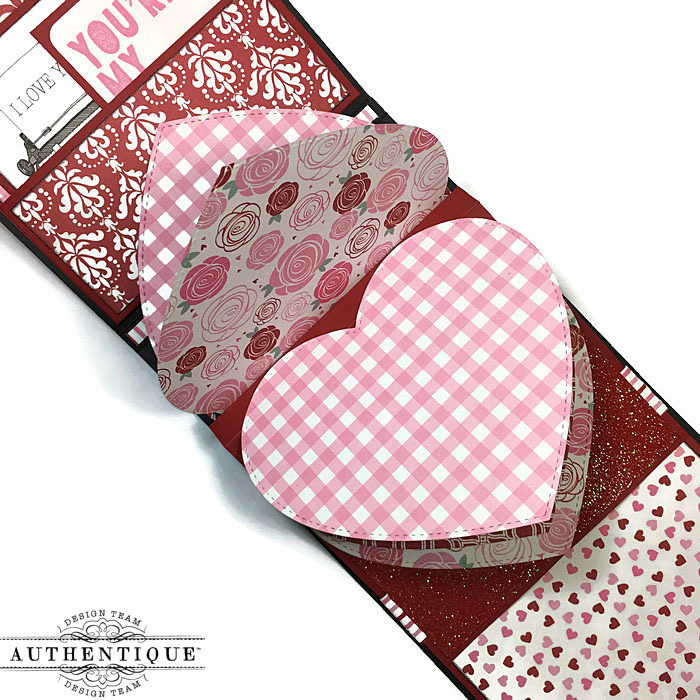 These hearts can hold wallet sized photos with no cropping needed. Mini has a magnetic closure. This mini is available for sale in my Etsy shop 'The Kraft Nook'. Feel free to stop by if interested. 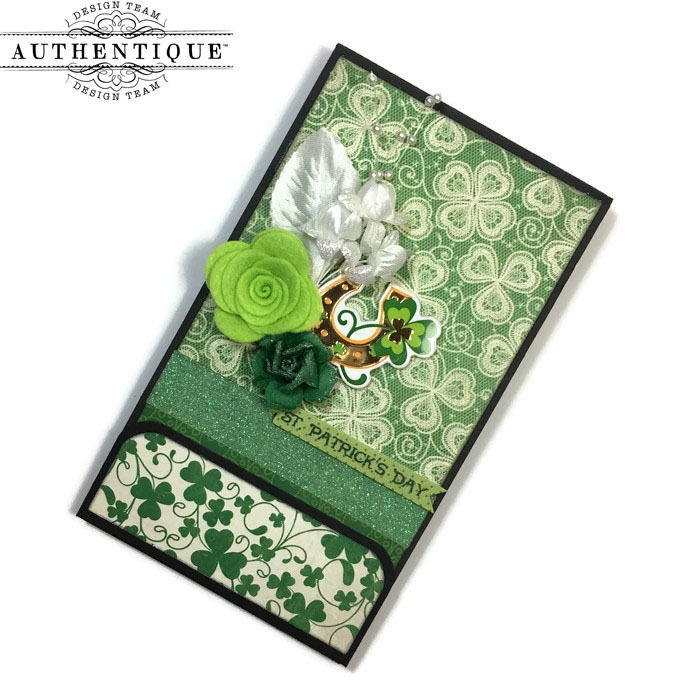 Soon after creating the Valentine's themed mini, I created this St. Patrick's themed mini with Authentique's 'Shamrock' collection. I had shamrock shaped die cuts that I wanted to use & try out my theory that different shapes could be used to create a waterfall. I was happy with the end result. First because it proved my theory & second because it turned out to be one cool looking shamrock shaped slider waterfall! I followed the same design as the 'Sweetheart' mini album--although this project turned out to be smaller in size. It's the size of the template being used for the waterfall that determines the overall size of the mini. The album measures approximately 7" x 4" inches with a 3/8" inch spine. 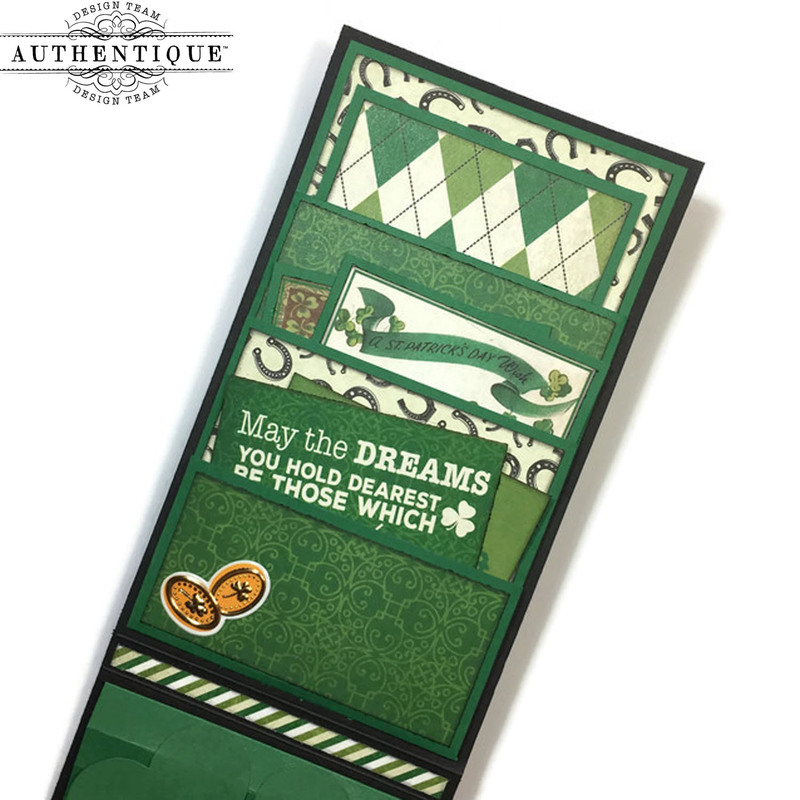 Just like the 'Sweetheart' mini, the base of this mini is made with 110lbs black card stock. 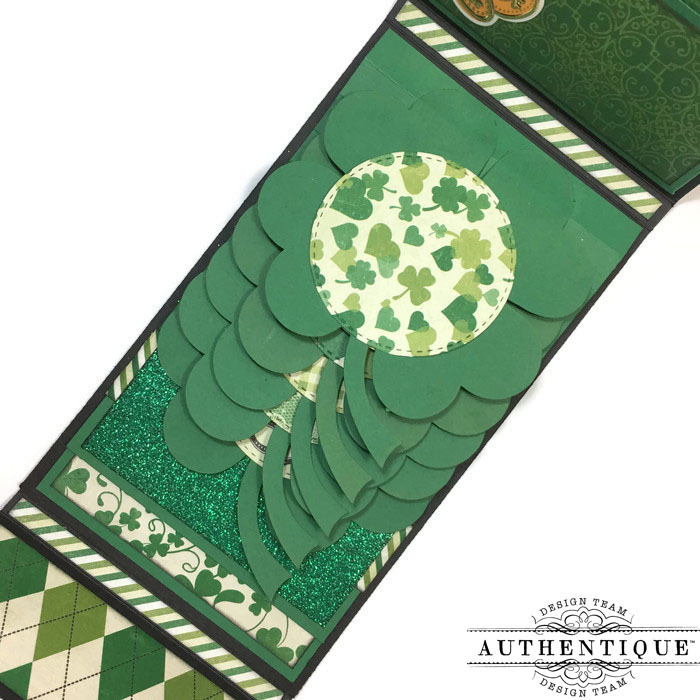 It opens up to reveal three full length pockets & a shamrock shaped slider waterfall. Inside the pockets are several tags/cut aparts ranging in sizes from 3 1/4" x 6 1/4" inches to 3" x 3" inches. 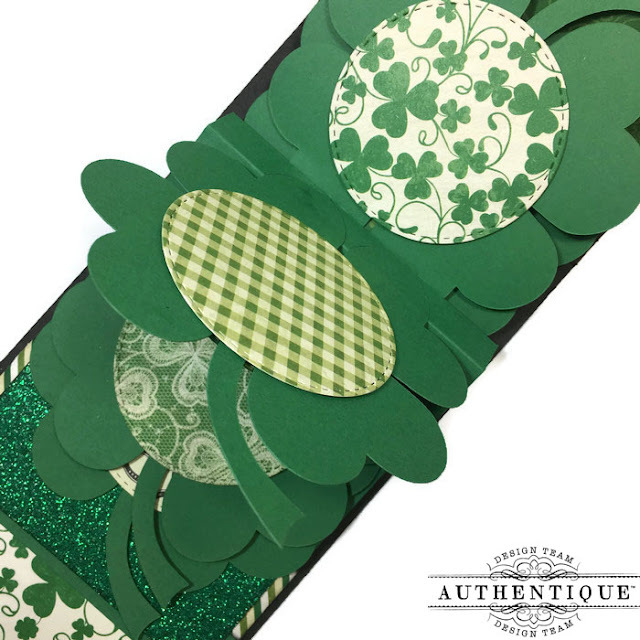 Since the shamrock has such a unique shape, I added circular photo mats to the center of each shamrock. These photo mats can hold circular photos measuring approximately 2 1/4" inches in diameter. This mini was also for sale in my shop 'The Kraft Nook' but has already been sold. I've created a tutorial on how to create slider waterfalls in any shape. You can find the tutorial below. As always, you can find this & all my other tutorials on my 'Tutorials' page right here on my blog. Enjoy & thanks for stopping by!